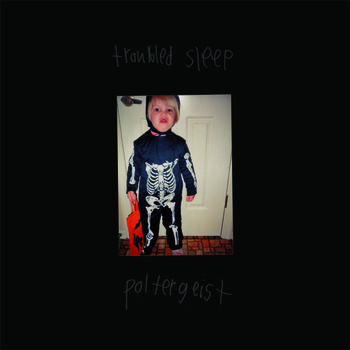 One Path For Me: Troubled Sleep - Poltergeist 7"
Troubled Sleep - Poltergeist 7"
Troubled Sleep are back with a follow up to their demo. If you missed my last review on them, Troubled Sleep is a 4 person indie band residing in Brooklyn, NY. They differ from the typical Brooklyn hipster fare and present an honest soundscape that bleeds with some great authenticity. "Poltergeist" picks up where the demo left off, but makes some nice improvements to recording quality. The new songs are crafted with a bit more precision and I definitely hear the emergence of some more interesting drumming, which I thought the demo lacked. The only thing that has me a little baffled is the double tracked female vocal. Vocally the voice is very dry and non-soulful. It has a certain charm and strength to it though. I think the voice is strong enough to stand on it's own, and the second track is not really necessary. It adds a certain sound to the music and perhaps the band is going for that. These 4 songs have more of an edge to them and hit a bit harder than the demo did. There are moments of softness, but only used as a great way to execute some well pronounced dynamics. From the beginning of the first track "Waltz" you even get a more explosive dynamic than the demo tended to carry. The song ends with an upbeat explosion of high gain guitar, and I found myself wanting the band to pursue this more.